Last Year: Runner Up, 1st with a 18-6 (+199) record and 40 points. Outplayed in the decider last year, the Dogs looked primed for another big season until Ben Barba was stood down two weeks before the first game. 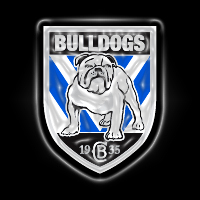 Barba could be back and that will be the dominant story surrounding the Bulldogs all year... and they also lost James Graham through suspension until Round 9 after he got a little hungry in the Grand Final. All that said - the Dogs should be a force again. Tony Williams can change games, but he needs to make an immediate impact to beat out Frank Pritchard or Josh Jackson for a starting spot in a loaded Canterbury backrow. Youngster Drury Low might fit the bill if given first crack at replacing Ben Barba, while David Klemmer is the only other relatively new face who might make an impact this season... then there is Trent Hodkinson who Canterbury fans might not recognise as their big money halfback from two years ago. BEST LINE-UP | If every player is available, this is the top squad listed 1-17. Daniel ABOU-SLEIMAN, Harlan ALAALATOA, Steve AZZI, Mitch BROWN, Tim BROWNE, Lachlan BURR, Paul CARTER, Dale FINUCANE, Josh GILL, Dean JANDA, David KLEMMER, Tim LAFAI, Brett LANE, Leilani LATU, Nathan MASSEY, Gerard McCALLUM, Ed MURPHY, Junior PALAU, Joel ROMELO, Jon Talioe SILA, Martin TAUPAU . Moses MBYE, David MINUTE, Lloyd PERRETT, Patrick TEMPLEMAN. No Ben Barba - that's confirmed, so look for Low to play, even if Lafai gets the 'Des Hasler call' in the centres. Keating will be the #7 with Hodkinson forced to earn his spot via the NSW Cup. Taupau starts for Kasiano, while Pritchard's spotty pre-season might see him on the bench. Klemmer's chances of debuting are threatened by Browne and possibly Romelo or Alaalatoa. CBY: Low, Perrett, Morris, Inu, Turner, Reynolds, Keating, Tolman, Ennis, Taupau, Jackson, Williams, Eastwood. Bench: Pritchard, Finucane, Halatau, Klemmer. David Klemmer is a gigantic teenage prop and he'll make his debut this season, possibly even in Round 1. Drury Low was a star in Canberra's NYC team for a number of years, and if he gets first shot at Barba's fullback job he could be a weapon. Jon Sila is in the Top 25 but is behind a couple of others for a top grade spot on the wing, while Harlan Alaalatoa, Moses Mbye and Paul Carter are all highly rated prospects at Belmore. Round 4 and 5 are quality matchups with the Bunnies on Good Friday afternoon at 4pm (March 29) and Manly the following Friday night (April 5). Round 15 should see Sonny Bill Williams back in front of the Canterbury fans on Friday June 21 - but being in the middle of Origin and this late in the season - some of the gloss goes off that matchup... some. Should be there... but with Barba? The side benefited in a massive way from Barba's brilliance last year to win the Minor Premiership but they should remain a Top 4 team during the regular season even if he isn't back for the majority of 2013. But if they want to go one step better in September - there's little doubt that a healthy Ben Barba is crucial to any team... even one coached by Des Hasler. 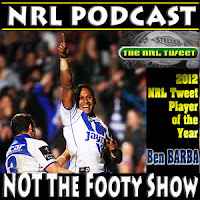 Can Josh Reynolds or Aiden Tolman take Ben Barba's mantle as the game's best player in the 2013 @NRLTweet Player of the Year Awards? Or can Barba return in fairytale fashion and win it again?